If I post this feature today, I will finally be all caught up with my 90 day features. My trip to Rhode Island (and sick boy friend) have made this catching up progress slow. But here we are, and I am pleased to introduce another multi-talented artist with 2 Etsy shops, based out of Utah. First we have alternatebliss, which carries original art, prints and fine silver jewelry. In this shop you will have FREE shipping on orders over $20! In her second shop, popblossom, you will find charms or pendants made with a combination of graphic design, plastic and resin. Here are a few of my favourites, starting with alternatebliss. This lovely poppy watercolour ACEO is pretty enough to frame, and perfect to add to your collection. A simple and sweet reminder of our veterans, something with which you can easily decorate any room (only make sure the matting in the frame is wide enough to balance the miniature painting ~ please see the listing for a great example). Another gorgeous piece from alternatebliss is this watercolour and ink "Crisp Green" print. 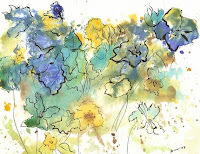 A gorgeous blend of blues, yellows and greens, this print is sure to brighten up any room. I love how the stark black ink picks out the flowers from the blur of colours. A stunning addition to any room and a great gift idea! Alternatebliss also carries stunning silver pieces, my favourite being this snowflake necklace. 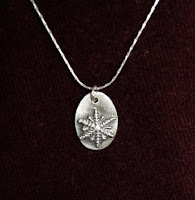 The intricate snowflake lies on a simple silver oval, making this a very versatile piece of jewelry. Perfect for a cold night out, or for lazing by the fireside, this pendant is sure to be worn all through the holiday season, and during the heat of the summer, when a cool thought is needed. Also a perfect gift for the holidays! Now for my top choices from popblossom charms. There are quite a few lovely pendants, and many funny ones too. 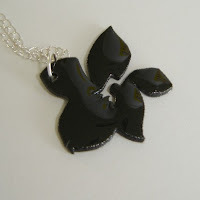 I really like the simplicity and stark beauty of this black cherry blossom pendant. It would be impossible to find an outfit that would not look good with this necklace. Perfectly balanced on a simple silver chain (or whatever you want to hang it on), this show-stopper is sure to turn more than a few heads! 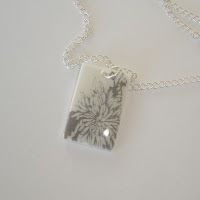 Another favourite from popblossom is this grey flower pendant. Another completely versatile piece ~ I love items I know I'll be able to wear with more than one or two outfits, and in more than one situation. This one is perfectly demure for an office meeting, but still cute enough for that first date. It would make a fantastic gift, especially to yourself! So please be sure to hop on over to these two shops, alternatebliss and popblossom, what I've shown you is merely the tip of the iceberg! There are plenty more wonderful designs in store! Make sure to take a look at her blog too, where you'll find more of these 90 day challenge features of great Etsy artists! Yay!! All up to date!! Stay tuned for other great shops taking part in the 90 day challenge! Great feature; I enjoyed reading it!